"Now I Stand Firm in the Lord"
Khat Sam Oeun is the pastor of Salt of Life Church in Kratie province, Cambodia. He and his wife have a 2-year-old daughter. I wanted to learn to grow straw mushrooms because they’re easy to grow and there’s a high market demand. I also wanted to ensure that my family would have enough food to eat. But I never learned how to grow them because there were no opportunities for training in my area. I prayed for someone to meet my needs. In October 2015, God answered my prayer. My church partnered with Samaritan’s Purse. It was the blessing I had been looking for. I knew that the organization worked with local church leaders and had projects focused on agriculture. Samaritan’s Purse provided me and all the church partners with training and tools for straw mushroom growing. This project helped my physical and spiritual health. It’s a fresh vegetable, so I don’t worry about chemical effects. The project has also helped me to have a good relationship with the community. Almost every day, my friends call me to ask about growing straw mushrooms. They sometimes invite me to help them because they want to learn from me. 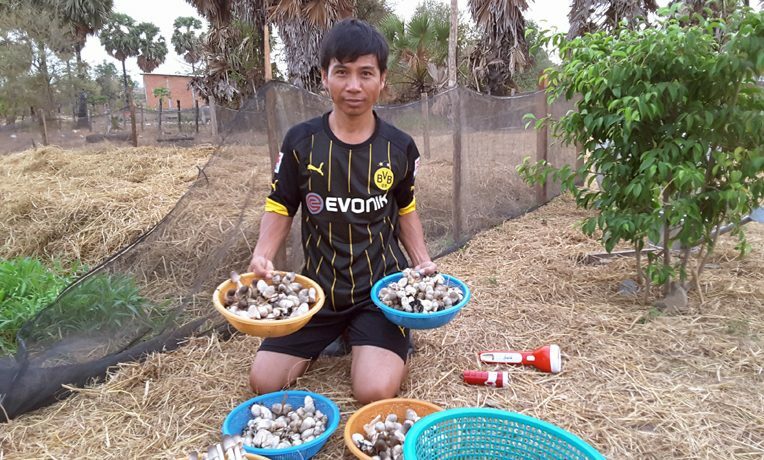 This month, I finished my second straw mushroom harvesting. Next, I plan to grow more mushrooms because it’s easy to do, and the high market demand means I have a good income. I’m thankful to Samaritan’s Purse for helping me by responding to my prayer. Through the partnership, my church has grown, and I have grown spiritually. I will share what I’ve learned with all my church members and friends in the village. I used to worry about food and income, but now I stand firm in the Lord because I know He will meet my needs.